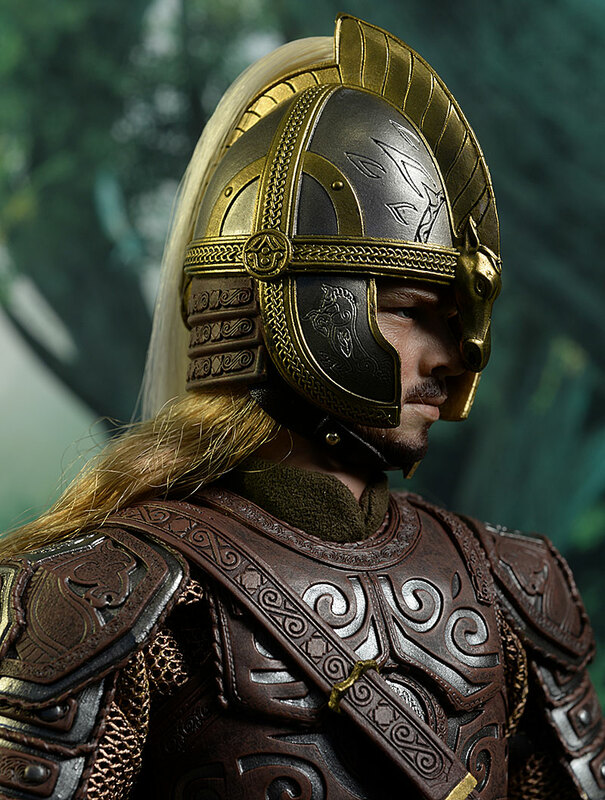 Asmus is hitting all the Tolkien films with their sixth scale release, from the Lord of the Rings trilogy to the Hobbit trilogy. Cutting across six films, there are plenty of interesting characters to choose from. Since we now, finally, after many, many years, have a complete Fellowship in sixth scale, it's time to get some more B players. 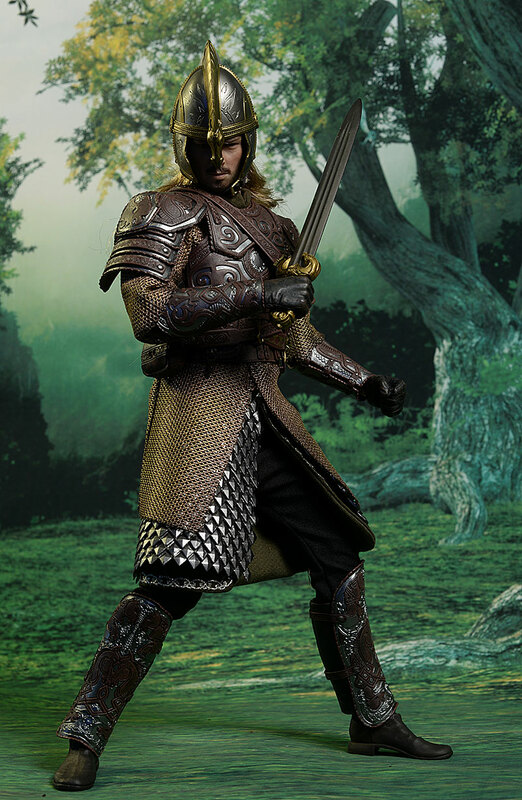 Eomer is just such a dude. His sister is Eowyn, who Asmus produced several years ago, and while he's a cool character, I wouldn't call him 'critical'. Still, this is the sort of human who can flesh out the display a bit. He just started shipping, and he will run you around $200 depending on the retailer. The package is pretty standard stuff for this series. The shoe box style design works well and is very sturdy, and the interior trays are completely collector friendly. There's a brief set of instructions, but there's nothing too complicated here. The face sculpt is quite good - very accurate, if a bit 'pinched' in expression. The skin texture is appropriate, with some nice wrinkling and pocking. The facial hair looks great too, as do the lips and eyes. They went with rooted hair on this one, which makes sense. The dude has some serious locks. But they went a tad over board in length, and you can see in the cover photo on the box the difference between the actual character and this figure. In real life, it hangs down just along the shoulder line, but the figure has hair that extends to the middle of his chest. It's clearly not accurate, but on the plus side, if you're willing to trim it yourself you can probably get a pretty accurate look. Better too long than too short. The hair line is a tough one too. Similar to the recent Arya from ThreeZero, the hair line has to blow back from the forehead. The simple reality is this always leaves an obvious edge. Both with Arya and here, a painted hair line was added to hide this edge a bit better. It worked great on Arya, but here it's not quite as successful. 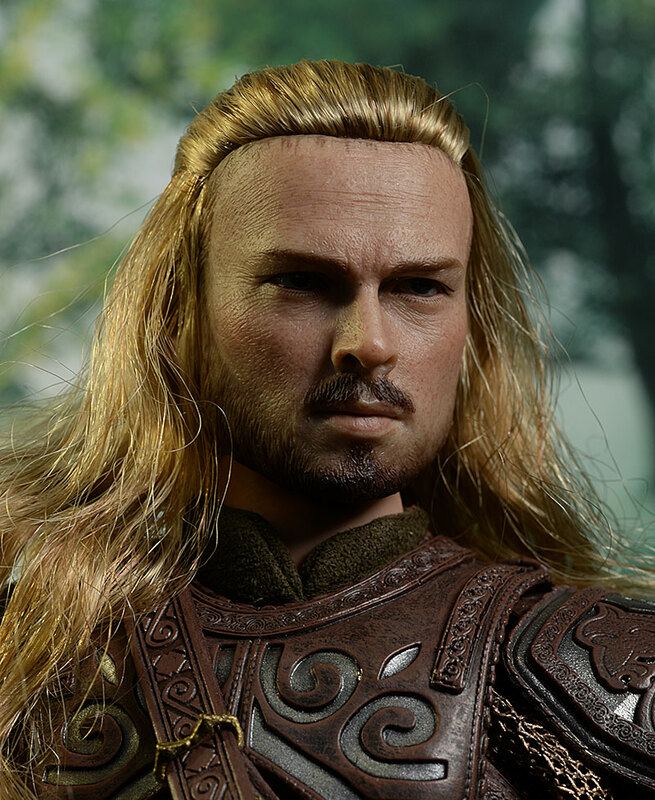 Eomer ends up with more of a fivehead, and because he has fairly small facial features and close set eyes, it's a bit more obvious. 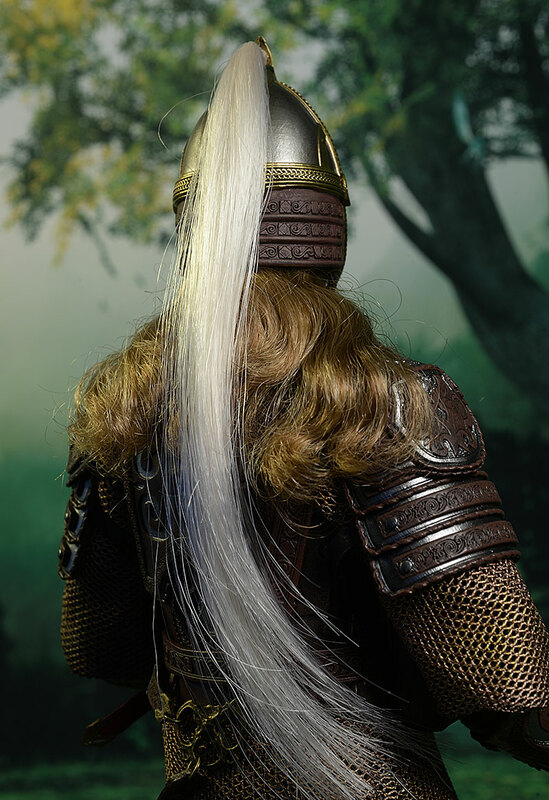 Of course, this is actually a figure that you'll display with the helmet in place, making some of this - particularly the issues around the hair - relatively moot. The sculpted detail on the armor is fantastic, and brings this figure back up to the level you expect. The paint work overall is excellent. The sculpt on the face is actually improved by the paint work - the hair line would be even worse if not for the added paint, and the skin tone is excellent. 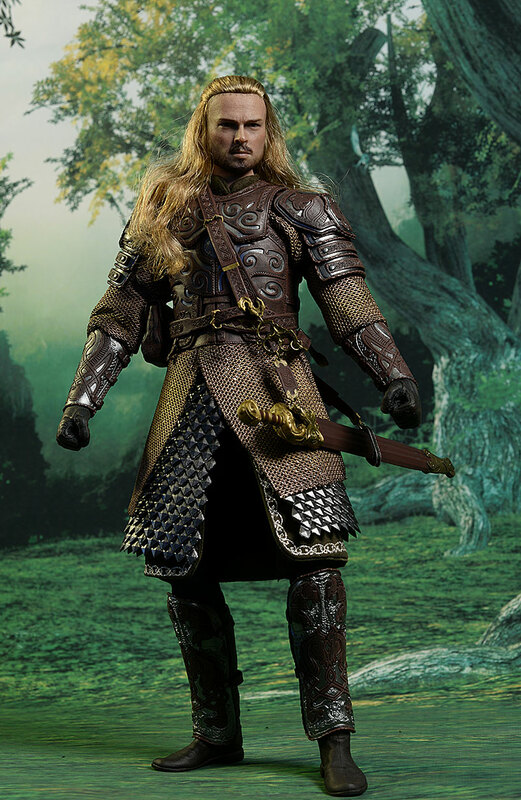 The eyes, lips, and facial hair are realistic, and the detail work on the armor is, once again, a highlight overall. It really is the work on the costume that stands out in this category. It's not flashy, but very realistic, with the right amount of wear and a muted, matte finish that works perfectly with the concept. The figure poses fairly well, but I had one major issue in this category. The neck works well, and thanks to the rooted hair, has a good range of movement. The shoulders, elbows, and wrists work as you'd expect in the heavy armor, and you can get decent arm poses with the various accessories. However, the torso is pretty much locked up by the thick plastic pieces and multiple layers. The hips, knees, and ankles have a good range too, and the two piece boots under the greaves allow the ankles plenty of side to side movement. Which is where I get to my issue. Had we ended there, I'd go another half star in this category. But the ankles are loose, too loose, and I had a tough time keeping him standing even in basic poses. There's some nice extras here, but again, not without a couple issues. He has four extra hands. He comes wearing open, loose hands, and you can swap in tight fists or a pair of gripping hands to use with the accessories. They swap easily enough, and stayed in place while posing. There's a couple extra wrist pegs too, just in case. He has two weapons - the staff of Ronin, and the sword called Guthwine. 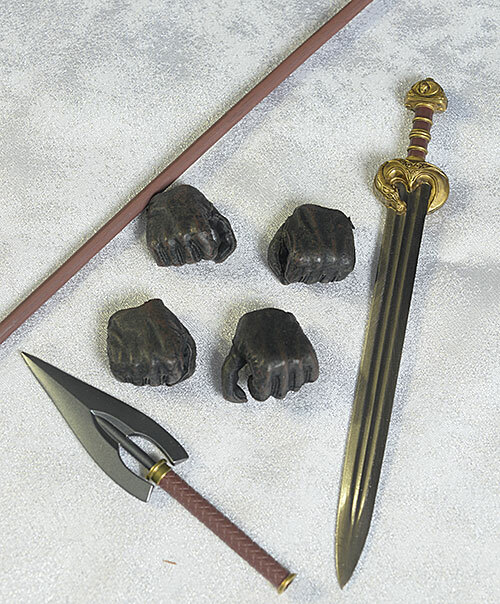 The sword has an all metal, heavy blade, but the arm joints were tight enough to keep it aloft. It fits neatly in a scabbard that is part of a complex belt system. It hangs around his chest, and while I don't love the buckle, the overall design works well. The staff is made of the sculpted tip and the long shaft. These come as two pieces, and can be connected by inserting one end of the shaft into the head. I don't love the way they connect (it's loose), but it's a minor nit. I already mentioned the scabbard and belts, but another piece of costume also comes as an accessory - his helmet. The sculpt and paint work are excellent, and I love the long, white tail on the back. The chin strap is appropriately sized too, and is easy enough to strap tight. But the shape of the front is off a bit, and pooches out from the face too far. You will be able to reshape it with some heat and tighten it up, but you shouldn't have to. I'm a proponent of a figure this expensive being correct right out of the box. I already discussed the helm and belts/scabbard, so I won't be including them with the Outfit discussion. 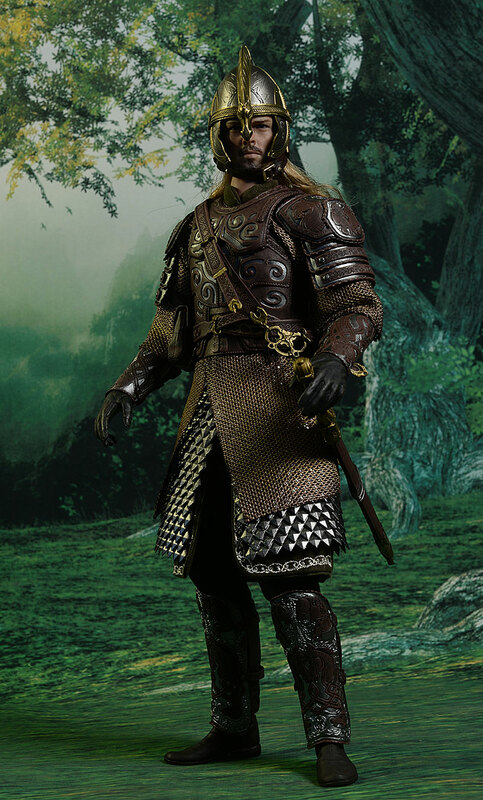 There are several layers here, with well sculpted armor over cloth. 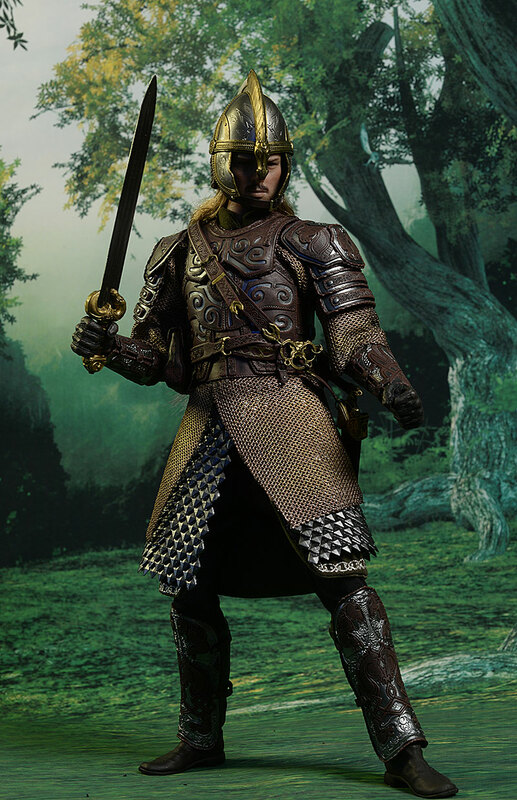 I love the choice of material for the chain mail, and the paint and sculpt on the plastic sections looks amazing. I don't know about you, but I'll be heating up the helmet to re-form it around the face a bit better, and posing this guy on the shelf in his full outfit. It's also worth noting he comes wearing another belt, and there's a great looking sculpted bag on the right side. 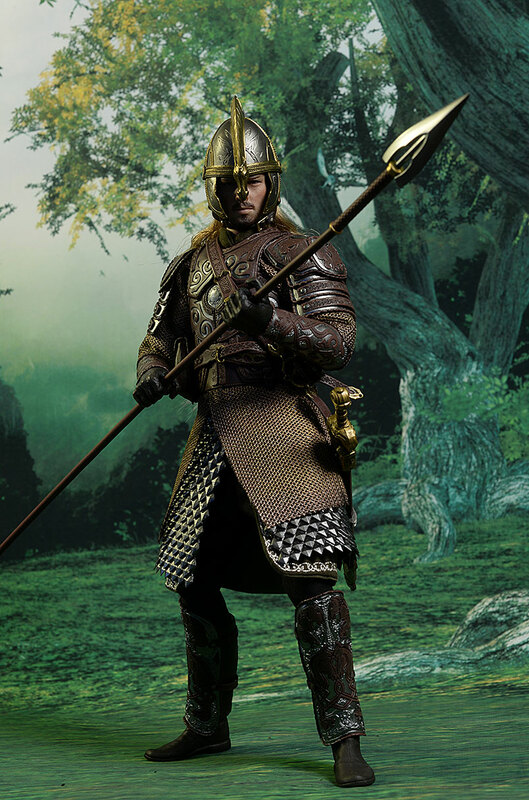 Add this guy in with the others, and you'll have fun creating your LOTR diorama. He's not somebody you'd pick up on his own, but thanks to the cool armor and ability to combine him with his sister, he makes a great B character addition. 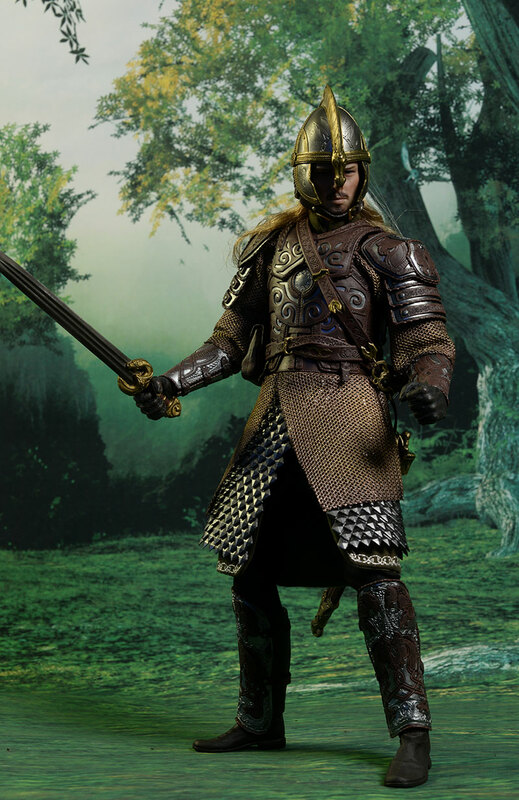 At $200, this guy is in line with their other recent releases like Gimli and Thorin. However, the sculpting and accessories aren't quite at the same level as these two earlier figures. I'm willing to go with an average score here, but he's not giving you the same kind of value as those two. This guy isn't a stand alone character of course. He's an add-in to the series, someone who adds some volume and thickness to the display. The hair's a little long, the ankles are a little loose, and the hairline creates a forehead that's more of a fivehead. But the outfit is excellent, the basic likeness good, and the accessories allow for some great displays. 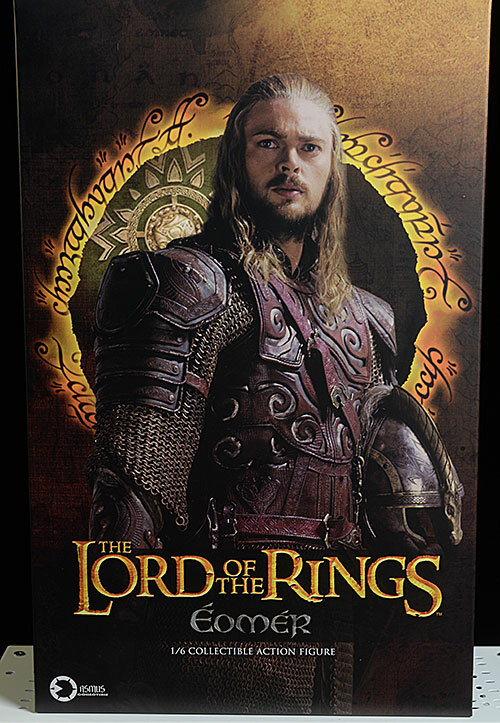 He's not a must have like Gimli, or quite the exceptional likeness that we saw with Thorin, but he's going to make his poor sister look bad on the shelf thanks to the overall improvements Asmus has made in the last couple years. Hey, how about a new portrait for Eowyn? - has him for $200. 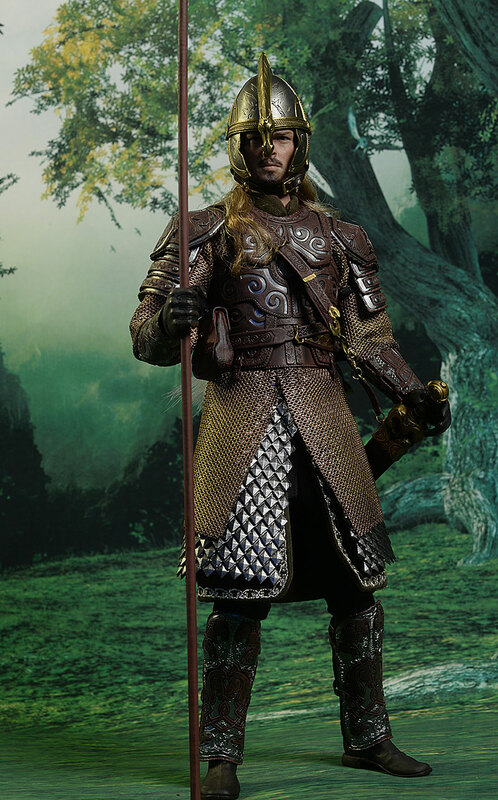 Other Asmus sixth scale LOTR figures include Thorin Oakenshield, Bilbo Baggins, Gimli, Boromir, Legolas, Thranduil, Sam and Frodo, Grishn'akh, Gandalf the Gray, the Mouth of Sauron, Merry and Pippin, and the excellent Saruman the White. 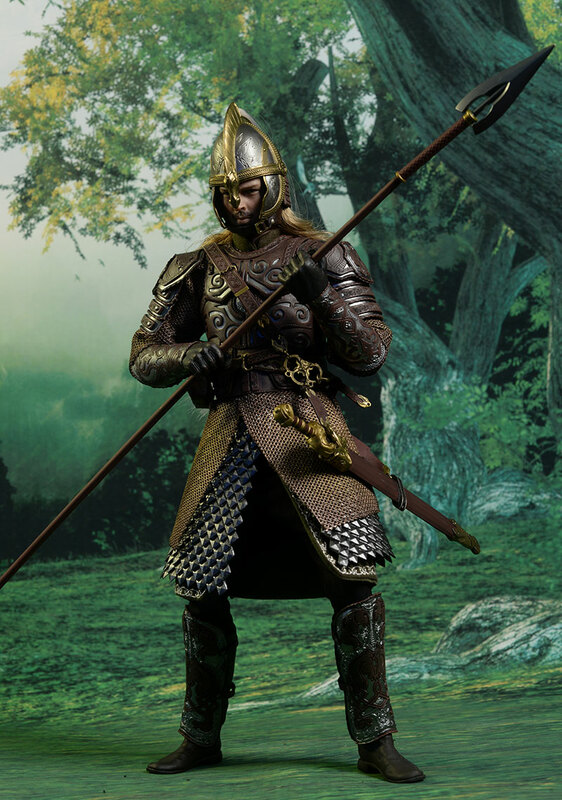 Asmus has also released Tauriel, Aragorn, Bard the Bowman, Eowyn, the Nazgul Steed, the Morgul Lord, Gandalf the White, Gothmog and Guritz.